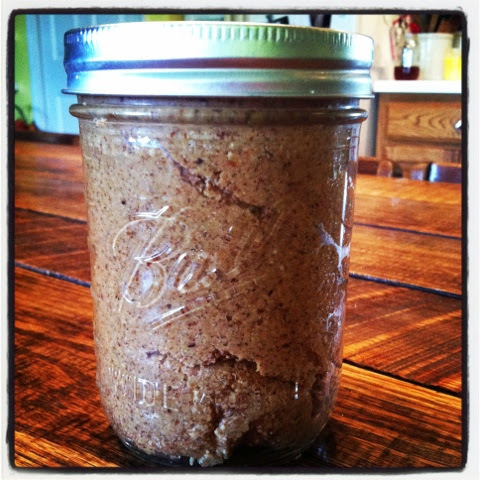 I didn't realize just how easy it is to make a nut butter. It is SUPER simple and you might just get hooked like we have! First, you want to make crispy nuts. Mix salt in water and cover nuts. Let set for at least 7 hours. Dehydrate 12-24 hours until dry and crispy. 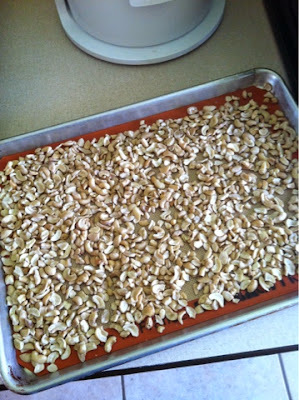 Once your crispy nuts of whatever kind are ready, then you want to toast them. I took them out of my dehydrator and laid them on a baking sheet with a silpat mat. Toast them at 350* for about 8 minutes. Shake the pan or turn the nuts and give them approximately 8 more minutes. You will know they are ready, because the smell will be insanely good! 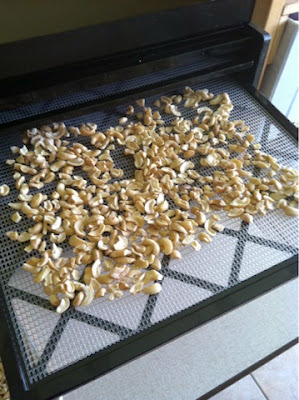 Once your nuts are toasted and slightly cooled, pop them into a food processor or a vitamix. Process. They will take several minutes. If you watch, you will see them turn from ground nuts, to almost a flour, to the butter. The oils will release and they will begin coming together in a ball. I added a few tablespoons of honey to ours and it is absolutely delicious!